I was dreaming the other day about Rome. Not about the unfairly attractive Italians dressed so stylishly while seemingly at ease. Nor about the monumentally towering architectural wonders that make the Italian capital one of the most stunning in Europe. And not even about what Italy is so well known for - its remarkable pasta. Or is it Art? No matter. None of that occurred to me during this wonderment of food related rapid eye movement that holds true meaning. I was dreaming of espresso. So many cultures seemingly own a specific food or drink that is directly associated to their identity. For the French, one could argue it is wine. Argentinians can raise their hand for beef. Think of the Japanese and you think of sushi. For Americans it might be barbecue. But for coffee, there is no argument. Not French. Not Columbian or Costa Rican. Not even an exotic Middle Eastern or African land. There is only one place where perfect coffee is made and that honor belongs to Italy. I love coffee in any form it wishes to give itself to me. Hot. Iced. Served with steamed milk. Providing a layer of richness in chocolate desserts. A surprisingly triumphant coating for rack of lamb. There are so many ways to enjoy one of the world's great culinary gifts. But this hot summer day brought me back to a steamy afternoon in Rome. Meandering the capital. Hordes of people lovingly gawking at the Fontana di Trevi. Touristic passion in its most visible form. A frenetic metropolitan chaos that works in spite of itself. We toured the Pantheon in the heart of the city. One of the greatest mausoleums in Italy where Italian kings and royalty are buried. Very much worth visiting, this structure was studied intensely by Michelangelo. His inspiration for the cupola at St. Peters comes right from here. God's house to many. As we walked outside, we saw little clear plastic cups of brown and white. Mouths smiling. Tongues dancing. Small plastic spoons serving their masters. A welcome respite from a humid afternoon. And off the Via degli Orfani there stands a temple to Italian Coffee - the Tazza d'Oro coffee shop. There is no point in comparing it to Starbucks as that would be like comparing the Pope to the unwashed masses - Being a believer doesn't make you holy. Tazza d'Oro is like coffee that has been brewed by God. An ascendent aroma. No, a miracle. But this shop is not really known for that. It is known for its granita. I love granita because it is so quintessenitally Italian which usually means complicated. Yet it is decievingly easy to make. Basic ingredients of water and sugar form the crystalline backbone that allow a central flavoring to be displayed in its true glory. The ice crystals in granita are so beautiful, as if formed by nature. A higher power. You can make the espresso either by machine, using enough water and coffee grounds to make 2 1/2 cups, or a french press (which is how I do it sans espresso maker and process works very well) brewing it for three minutes, or simply combine the coffee and the water in saucepan and bring to a boil. Using this method take the saucepan off the heat as soon as the liquid boils. Add the lemon zest and let it infuse with the coffee mixture for 3-5 minutes. Strain the mixture into a bowl through a coffee filter. If you are using a french press add the zest to the pot, infuse as directed, and then strain through the press. Pour the infused coffee into a bowl and add the sugar so it will disolve while the coffee is cooling. Add the lemon juice and stir well. Pour the liquid mixture into a 9x9 pan. It should be about 1/2 inch depth. Freeze for thirty minutes on a flat surface. After 30 minutes take out the pan and with a dinner fork scrape the semi frozen liquid from the perimeter of the pan to the middle of it. Smooth out the mixture so it is flat. At this first stage it will only be semi frozen and quite liquidy. Place the pan back in the freezer and repeat this same process every 30 minutes, or a total of four times for a period of two hours). Each time you scrape the mixture you will help the granita crystals form. In a non reactive bowl, mix the whipping cream and sugar together until stiff peaks form. When you are ready to serve the Granita take it out of the freezer and let it warm up for 5 minutes. Scrape each serving from the pan with a spoon. The texture will look like hard snow. In a glass or serving dish spoon about 1/4 cup of whipped cream. Add a 1/3 cup of granita. Add another 1/4 cup of whipped cream and then a 1/3 cup of granita. Finish with a small dollop of whipped cream on top and serve. 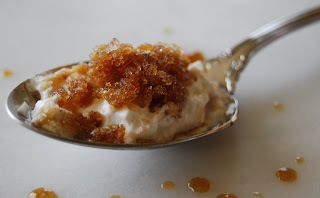 This recipe is modified from Nadia Rosen who wrote a wonderful book titled "Granita Magic". I have used her book often to learn how to make granitas and it is excellent. Beautiful post. I love Granita. Your recipe looks great--perfect for a summer evening alfresco. Years ago, I made one for my friend's birthday it was an expresso Granita with an Ouzo Panna. It was amazing. The anise flavor goes really well with the strong coffee taste of the Granita. i love the pictures and this recipe. i will have to make this. Yum that looks wonderful! I have always wanted to go to Italy. You have a great blog! Love this dessert! 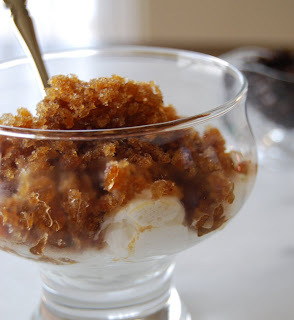 Granita is one of my favorites! I know I'm going to have to make this soon, you made me crave it! This must be sooo refreshing... LOve it! i've been to room 3x but i am long overdo. i must make this one! I love desserts with coffee! Combining the best of both world! Love it! oh, the coffee in Rome! what a treat! as i sit at my desk, drinking Cuban espresso, your post took me way back to when i was in Italy. Never had this, but it would be marvelous. Thanks for finding. I think we can be friends and share lots of travel stories!